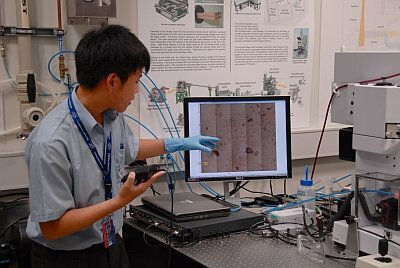 Perth teenager Darren Ng, a year 11 student at All Saints College in Bull Creek, recently became one of Australia’s youngest synchrotron users when he used synchrotron infrared microspectroscopy to help examine a series of fingermarks. Darren shared the excitement with his classmates back in Perth through a live videolink set up by Chris Myers and Michael D’Silva from VERSI at the synchrotron end and Darryl Watson at the college in Bull Creek. After being trained to use the infrared beamline and microscope equipment, Darren started work under the guidance of Simon Lewis from Perth’s Curtin University of Technology, and Danielle Martin from the synchrotron’s IR beamline team. “I wanted to make sure that Darren was able to run as much of the experiment as possible so I taught him to use the IR microscope as I would any other user at the beamline,” Danielle said. “He picked it up fantastically. Darren examined fingermarks from his school principal, Geoffrey Shaw, using these to explain the concepts involved in the analysis to his classmates and teachers in Perth, who were then able to ask questions. Simon and Darren also supplied and examined two other types of fingermark: ‘charged’ fingerprints, taken after the subject has rubbed their fingertips over oily areas of their skin to create thicker, oilier prints; and another called ‘groomed’ fingerprints, where the prints are taken from a clean but sweaty hand. Darren’s synchrotron project was undertaken as part of his and Simon’s involvement in the International BioGENEius Challenge. The winners of the Western Australia BioGENEius Challenge will compete in the International BioGENEius Challenge held in Washington, DC, in June 2011. The fingermark experiments form part of an ongoing national research investigation led by Simon Lewis in association with Kieran Lim from Deakin University in Melbourne. Danielle said that the project was a good way to give young students a small glimpse of the world-class scientific developments occurring within Australia and around the world. “In this way we can reach out to and enthuse students in distant locations, and give young students an improved understanding of ‘the bigger picture’. Synchrotron science is a relevant part of current school curricula in physics and chemistry, and secondary and primary schools are able to arrange visits to the facility to see it in operation. However, distance and other factors can mean that this option is not readily available. “This exercise enabled us to expose these students to the concept of IR spectroscopy and its application across many fields of science, in this case specifically forensic science. We really enjoyed the opportunity to demonstrate the beamline to such enthusiastic students, particularly those who may not otherwise have a chance to visit the synchrotron. We are keen to run similar sessions again.